The Center for Limnology provides a diversity of research opportunities for undergraduates students interested in gaining further experience in freshwater systems. During the academic year, undergraduate students are engaged in independent research: Directed Studies in Zoology (Zoology 299 or 699), Senior Thesis (Zoology 691-692) or Senior Honors Thesis (Zoology 681-682). Undergraduates are also employed on various research projects. The Center for Limnology provides summer research opportunities in the form of hourly positions and undergraduate fellowships. These may be based at the Hasler Laboratory in Madison, Trout Lake Station in Boulder Junction, or other locations. If you are interested in research opportunities, please check out webpages of individual researchers (see People pages) at the Center for Limnology, and send an email inquiry. The CFL strives to support a diverse community of undergraduate students, and fully supports UW-Madison’s mission to increase diversity. 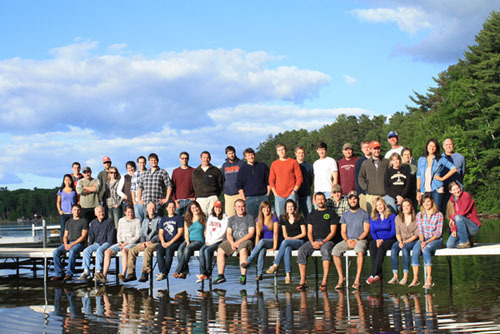 LAFS is the student organization for those interested in limnology and marine science. Undergraduate, graduate students and post docs are welcome. Contact Ben Martin at bemartin@wisc.edu.